This article was written by Charles Watson of WorkForce Guardian. Back in law school we were taught that the way forward was to no longer draft overly complicated and technical documents for clients that were full of confusing “legalese” that could only be interpreted and understood by another lawyer. Rather, the focus was to be on the client and the recipient who had to read the document. Keep the language formal, but understandable. The benefits of simpler, more direct drafting were obviously beneficial. No more quasi-Latin terms or words like “henceforth” and “herewith” unless you were directly dealing with a judge or wanted to deliberately intimidate or scare the recipient. This was a great step forward in making the law accessible and understandable to everyone. Although it must be said that the volume and length of legal documents has not reduced, but that’s an issue for another discussion (anyone tried to read the entire terms and conditions of use for a social media platform or IT software?). So we move forward in time and a few brave companies have recently commenced using contracts of employment that combine pictures and words in place of the traditional text only format. Those companies hold the view that these pictorial based contracts will be more accessible and easier to understand for the new hire. Aurecon, a multi-national engineering company, are the first in Australia to introduce such a novel approach. Based on an intent to “make the complex simple” and “be playful with serious intent”, Aurecon is hoping the introduction of this new type of contract will result in a focus on building relationships between the company and its workers, rather than intimidating them with an overload of legal text. Although at first consideration this approach is a bit of a shock to the legally trained mind, there are immediately obvious benefits to the pictorial approach. It is true that candidates receiving a lengthy contract to read and sign can lose interest after the first few pages, which can detract from their successful onboarding. Workers who may have learning difficulties or poor English skills, those people who learn better through visual communication, as well as young workers, could benefit from this novel approach. Further, such a novel approach to employment contracts or other workplace documents that are distributed to an entire workforce, such as workplace policies, could keep levels of engagement higher by piquing the interest of the reader long enough so they might actually read them in their entirety. This novel, or animated, approach to employment contracts has not yet been tested in a dispute before a court. When it does, what will be the issues to overcome? Primarily those issues will relate to interpretation and enforceability. Can a pictorial contract provide adequate certainty and what views will the courts take? Retired High Court judge, Justice French, has commented that such a step was “bold and socially useful”. However in legal circles the use of the word ‘bold’ can often mean ‘not without risk’. Nonetheless Justice French has expressed confidence in the enforceability of cartoon contracts. There are many questions to be addressed if a company intends to use visual mediums of communication. The problem, at least as we see it, will arise out of determining the certainty of contractual terms that are expressed in cartoon form. Some contractual terms may be straightforward enough to lend themselves to animation. However, more complex employment issues such as confidentiality, intellectual property and post-employment restraint clauses may require greater consideration as to whether they can and should be expressed in cartoon form. If confusion ensues, a court or tribunal will make a determination, perhaps after seeking advice from their grandchildren. Will workers take offence to the way they are portrayed in such documents? Will there be poorly thought out kneejerk reactions by those involved who may overanalyse the animation style rather than the purpose and good intentions of an employer? Undoubtedly there will be naysayers and reactionaries. Nonetheless, any animation used would have to pass the sniff test – it should be respectful, and not discriminatory, humiliating or belittling. It’s a novel idea that won’t be for everyone, but perhaps there is something to this pictorial approach. Plus it will bring lawyers, their clients and visual artists closer together. So long as we can all comprehend the intention of the cartoon contract and there is little to no ambiguity when reviewing the document, cartoon contracts might find relevance in workplaces. The middle ground approach may be a start. Although it’s early days, there may be benefit to using this approach by including some visual representations in company policies, which support or supplement the written content of those policies. It would help those who learn differently, and perhaps keep the interest of those who would not otherwise be keen to read the enormity of company policies that have to be in place to protect companies and guide workers about acceptable behaviour. We look forward to seeing how this approach plays out. 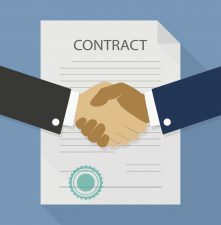 Perhaps the gaming industry can step in and make contracts interactive?